As the new director of the Birmingham Museums Trust, Dr Ellen McAdam is hoping to expand locally and internationally. The nononsense Scotswoman tells Graham Young of her vision to bring the city's myriad attractions into the hearts and minds of all. 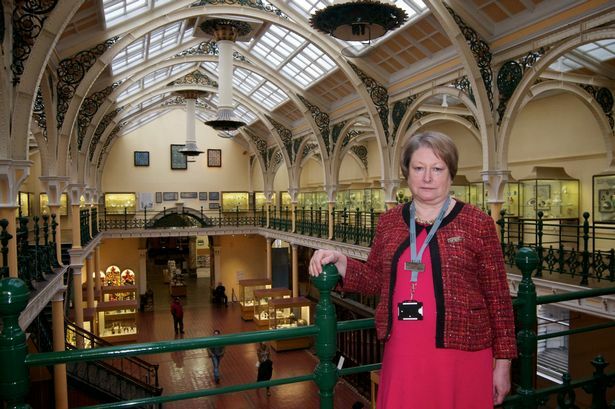 Dr Ellen McAdam is the new director of Birmingham Museums Trust. You might expect a Scottish mother and archaeologist to be as soft as a pair of Highland sheepskin slippers, but there comes a point during my conversation with Dr Ellen McAdam when I feel like I’m talking to battle-hardened Kate Adie in disguise. Stories of being shot at, staying next door to a hotel that was blown up and giving trigger-happy Kalashnikov-wielding solders a good old tongue lashing are the last thing I’m expecting. But the courage under fire tales come thick and fast when talk about her archaeologist work in Iraq arises. “Sometimes I brazed it out, sometimes I just legged it,” she says of the days when trouble called. Dr McAdam has a warm smile while recounting adventures like these, but she prefers to be photographed with a straight face. Luckily for her, she saw the best of Iraq in 1978, before Saddam Hussein took power on July 16, 1979. By 1988 (the year of the chemical attack on Halabja), it was increasingly unsafe to be there and she doubts if she will ever return. Not for the first time during our hour-long interview, Dr McAdam refers to how such travels taught her how to handle myself. As a teenager, she’d spent much of her gap year in Victoria, Canada, where she “had part time jobs and knocked around a bit” – by choosing to study at the University of Edinburgh’s renowned archaeology course, Dr McAdam was able to leave school at 17 and see a bit of the world first. A doctorate at Oxford University followed and she has arrived in Birmingham via spells in London and most recently her native Scotland where she was head of museums and collections for Glasgow Life. Did accident or ambition lead her towards a more administrative existence? “It’s called leadership, dear boy,” she chides, as I slowly begin to expose her underlying sense of humour. But yes, Dr McAdam did need ambition just to break into an industry where a need to keep volunteering can be overtaken by the chilling realisation that a PhD can make you over-qualified for general posts. “I don’t think you really know what you want to do when you are young,” she says. “I just knew I wanted to work in museums but didn’t realise how difficult it is, so I almost came into them by accident and suddenly found myself at the Museum of London. Dr McAdam’s appointment follows the interim leadership of fellow job candidate Simon Cane, who stepped up to plug the gap left by the unexpected departure of Professor Ann Sumner. After just eight months in the job, Prof Sumner resigned in October 2012 for personal reasons and then became the Brontë Society’s first executive director last February. After Dr McAdam’s appointment was announced on July 26, she stepped into her new role on October 7. What does she recall from that day? “You’re introduced to lots of people and you immediately forget their names,” she says, before joking how you are only presented with the “good bits” of a new job during the interview process. Four months into her post has been enough time to realise how much she already loves Birmingham and can’t wait to start selling it more effectively to the world in order to bring more tourists in. “The people are very funny, but far too self-effacing,” she says. “They should boast more about what a great city we’ve got. “Birmingham has the best civil collection in England and our 25,000 strong Pre-Raphaelite collection is arguably one of the best in the world. “The Smethwick Engine (a Boulton and Watt machine from 1779 that’s now at Thinktank Science Museum) is the most significant of its kind in the world. “And then there’s the Staffordshire Hoard, the most expensive cherry on top of the thickest icing on top of the most luxurious cake. It’s even the right colour for a cherry! “Our museums have an international reputation for developing new and more engaging ways of attracting audiences but there’s a lot more we could do and we want to do more, especially with how people grew up and lived and worked in Birmingham. Having just been to the Coventry Transport Museum and found that it is still free, will there come a day when her own Thinktank Science Museum is able to welcome people with open arms? While BMAG is free and most of the other city museums have modest charges, it costs a family of five like mine £47.40 for an on-the-day single visit – or some 2,000 households have an annual membership of £85. “The Thinktank business model is that it had to charge in order to be financially sustainable,” she says. “That’s still the case. The amount of central and local government funding is declining and a lot of (other) places that currently don’t charge are thinking about that. On the plus side, though, Dr McAdam says the BMT is “incredibly lean if you benchmark us against other services. Ways of generating future income will include catering, retail, venue hire and developing international touring exhibitions – the Trust has so many collections in store it can’t put anywhere near as many as they would like on display at any one time. To raise money, I suggest uniting the Staffordshire Hoard in one place for several months and marketing it as “Britain’s Tutankhamun”. But the shared ownership of the Saxon treasure with the Potteries Museum & Art Gallery is a barrier which Dr McAdam does not envisage being able to hurdle. One of her key jobs in store will be to revive the Birmingham Museum & Art Gallery building in order to take advantage of the redevelopment of Paradise Circus. “There is a huge amount of audience research which shows that people have difficulty finding us,” she explains. “And they are put off by the grand entrance. Simon Cane, now Dr McAdam’s deputy, told me how Manchester had closed its main museum for a year in order to deal with the complex legacy of ageing plumbing and electrics. “We are the only regional museum that hasn’t had a big project to overhaul it,” she says. “No major work has been done since 1980. “Nothing has been planned yet and there is no architect, so it’s too early to say how we would handle it. But most institutions have to close, otherwise you risk damage to works of art. We do need more space to display things... we need to ‘get stuff out’, that’s the technical phrase. Heritage Lottery Funding would also demand that there be a greater rotation of works of art – something the Pre-Raphaelite collection would benefit from given the fragile nature of the papers. Another aspiration would be to have the ability to do more with school visits – currently running to capacity in terms of official tours. “If you ask a child what they’ve done at school that day they very often can’t tell you,” says Dr McAdam. Comparing Glasgow’s relationship with Edinburgh to Birmingham with London, she notes how Glasgow had the heavier industry of the two second cities. And she points out that some of our key industrialists, like James Watt and William Murdoch were Scotsmen. Another connection, she reasons, is that people are surprised how much they like Glasgow and Birmingham once they have arrived. Dr McAdam grew up in the Dumfries and Galloway borderlands and, as a child, was able to roam about under own free will. Her late parents were a solicitor and psychiatrist, with her deputy superintendent father able to house them “in the middle of a golf course in the middle of a mental institution”. “Working on the railway and in textiles, my grandparents had put a huge emphasis on educating their children. “Almost everybody I played with was the child of a psychiatrist. “And we were mostly left to just get on out and play and wander around the grounds of the mental institution. Dr McAdam’s mentor was the former curator of Dumfries Museum, Alfred Truckell MA, MBE, FSA, who died aged 88 in 2007. If there’s one thing which sees Birmingham triumph over the beauty she found in British Columbia after leaving Scotland behind, it’s British history. “We’ve got lots of it and we’re still making more,” she enthuses. “My office is underneath the new history gallery and I can hear the footsteps of boys when they are visiting with classes. “You can see how boys learn through real objects, especially those on the autistic spectrum. I’m a great believer in the power of the real object. “And if you can get whole families in, you can see grandparents who do (the teaching) for you. A good museum should be a social space and not posh, elitist or intimidating. Dr McAdam knows the audience she wants to attract will be interested in local history. Her passion for local history, though, doesn’t extend to wanting to keep the 1974 Central Library next door. Dr McAdam is a model of diplomacy when I wonder if she’ll be brave enough to join Ikon Gallery director Jonathan Watkins in calling for it to be saved. “They should have kept its (Victorian) predecessor,” she says. “That was a fine building. “I don’t think that particular development (the Central Library) has worn well.